According to a new review published online in the British Journal of Sports Medicine, researchers suggest that tai chi could effectively improve physical capacity in common long-term conditions in older adults, such as heart failure, breast cancer, chronic obstructive pulmonary disease (COPD), and osteoarthritis. In traditional Chinese medicine, tai chi is a form of martial arts that dates back about 2,500 years. It involves a number of gentle, slow, and meditative movements that was originally designed to promote calmness and inner peace. It also improves posture, balance, and muscle power. Researchers from the University of British Columbia and the University of Toronto compiled 1,102 relevant online articles published up to 2014 on tai chi in patients with COPD, heart failure, osteoarthritis, and cancer. From the articles, 33 met the criteria for the review, which involved 24 trials and 1,584 participants. Twenty-one of the studies were included in the review. The participants’ ages ranged from the mid-50s to early 70s. The average tai chi program was 12 weeks, two to three times a week, with most sessions lasting about an hour. The research team discovered that tai chi was linked with definite improvement in muscle strength and physical capacity in the four long-term conditions in the review. The improvements were found in quality of life, the time it takes to get up and move, muscle strength from stretching and bending the knees, and a six-minute walking test. Researchers also found that tai chi could improve breathlessness in COPD, as well as sit times, stiffness, and pain associated with osteoarthritis. 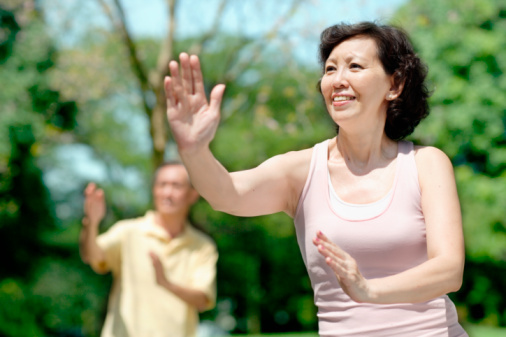 The study supports previous research, and it provides solid groundwork for exercise programs like tai chi for those with multiple long-term health conditions. Chen, Y.W., et al., “The effect of Tai Chi on four chronic conditions—cancer, osteoarthritis, heart failure and chronic obstructive pulmonary disease: a systematic review and meta-analyses,” British Journal of Sports Medicine 2015, doi: 10.1136/bjsports-2014-094388. “Tai Chi linked to improved physical capacity in certain common long term conditions,” ScienceDaily web site, September 18, 2015; http://www.sciencedaily.com/releases/2015/09/150918080616.htm. “Tai chi: A gentle way to fight stress,” Mayo Clinic web site, last updated June 25, 2015; http://www.mayoclinic.org/healthy-lifestyle/stress-management/in-depth/tai-chi/art-20045184.